Meet Beta, a 15-month-old German Shepard in the driver’s seat of his patrol car. Beta and his handler, Officer Jeanne Hall (not pictured) are the newest members of the UTPD’s K-9 unit. The purpose of UTPD’s K-9 unit is twofold: sniffing out narcotics and detecting explosive devices in and around campus. With the University of Texas Police Department’s newest K-9 officer Beta sitting next to her, Officer Jeanne Hall said K-9 handlers usually look for determined and hardworking dogs. Beta, a 16-month-old German shepherd, joined UTPD’s K-9 unit in November, becoming the third dog to join the unit. Beta’s calm personality is much like hers, Hall said. Hall said she began getting acquainted with Beta before attending a training facility in Arkansas where they trained together for two weeks. Hall started working at UTPD about two and a half years ago and became a K-9 handler in November. Since she and Beta are both new to the unit, Hall said she is not ready to have Beta deployed yet because she wants him to get more oriented with his surroundings. All of UTPD’s K-9 officers are dual purpose dogs, meaning they are trained for bomb detection and criminal apprehension. Before large events such as football games, graduations and VIP lectures, K-9 officers sweep venues for explosive devices or any other kind of threats. Sergeant Eric Johanson, the handler for K-9 officer Jarno, a 4-year-old Belgian Malinois, said it is important to take such precautions on a large campus such as UT. 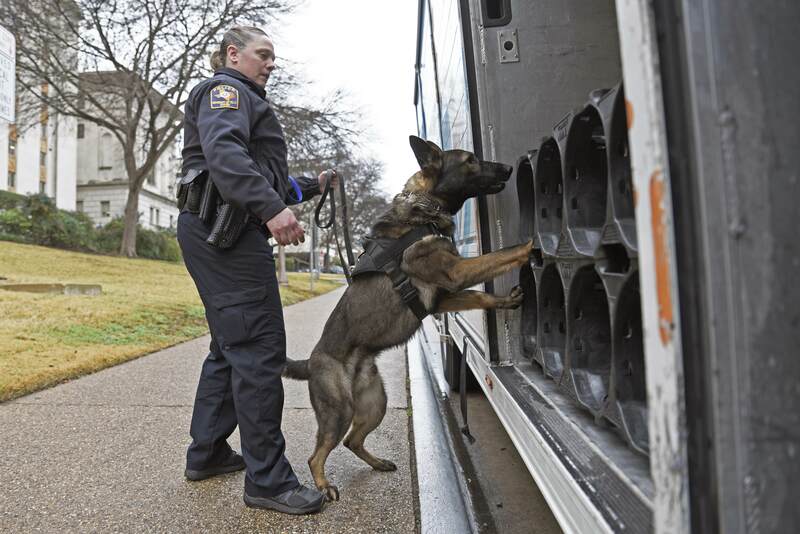 UTPD’s K-9 officers have been imported from overseas — Beta is from Slovakia. Johanson said a lot of these dogs have trained to be working dogs since they were puppies.